Yes, that’s a styrofoam plate. What, are you surprised that someone with my taste and style would eat from anything but fine china? I didn’t think so. I can’t fool you intelligent reader people. You know that fine china doesn’t matter to me. I care about taste, texture, atmosphere, fast cars, and fast wom…wait, just kidding about those last two things. Let’s talk about this burger. My wife and I had just walked 18 holes so we were running a calorie deficit the size of Texas. We needed food, and we needed it fast. So we headed to the Hackney’s on Harms on this beautiful summer evening, figuring that they would have no problem fitting two people in with that massive outdoor patio they have. Wow, I was wrong. It was packed, I’m talking jam-packed. No parking spots, people milling around all over the place, cars parked on the street, dogs and cats living together. ‘Twas a nuthouse. So we left. We hit Meiers Tavern at 235 West Lake in Glenview. We were a little nervous as we pulled up because the tavern was dead. We figured it would have pulled in some of the Hackney’s overflow, but there were only about 10 cars in the lot. However, I didn’t let this discourage me, I had heard good things about the place so I convinced my wife to accompany me. It was that, or she could wait in the car. Ha, just kidding. The burger was great. A little small, but done right and with good flavor. 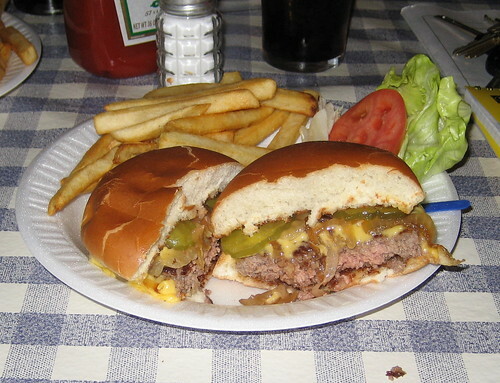 They put plenty of American cheese on it and the grilled onions were buttery and flavorful. The bun was toasted nicely, I think they actually stuck it in the oven for a little because even the top was toasty. Nice touch. The atmosphere is all bar. I get the feeling that people come here primarily to drink beer. The good burger is just a bonus. This suits me just fine. My wife was not quite as impressed and she struggled a little with the atmosphere, but she enjoyed her chicken sandwich. It helped that I was really nice to her for being such a trooper. I even offered to stop at Dairy Queen on the way home for a malt but she declined. Great place, just know that it is a bar and you’re not going to get ceramic plates. Posted in food on 2007/06/14 by John.